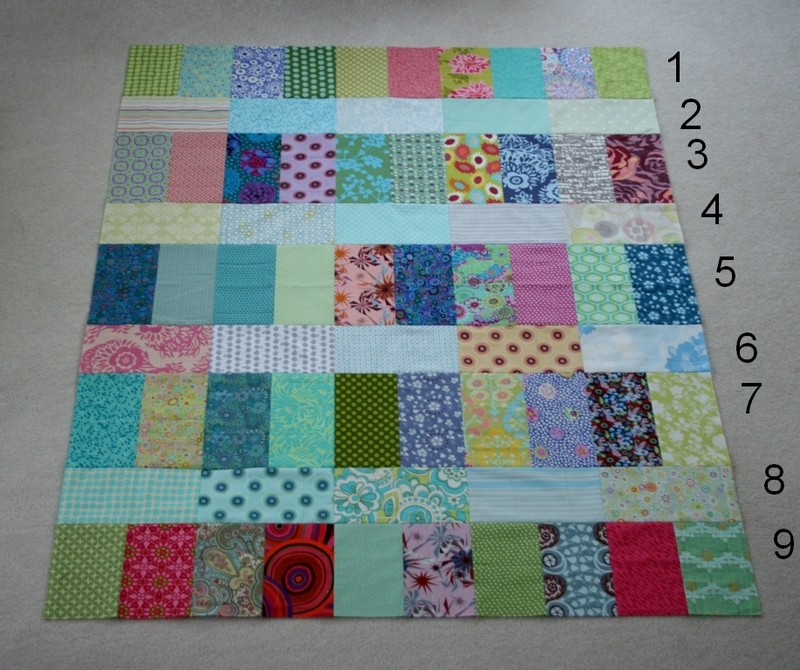 crazy mom quilts: use your stash! What a great challenge for yourself! I LOVE the pattern, you are right it is such a great way to showcase those beautiful big prints! I really love this Amanda Jean!! I have so many large scale fabrics that I have no idea how to use...this is perfect! This would make a perfect quilt for a graduation gift! I love your plans for using up your stash! Sounds like a great idea that I will have to try. I really like the quilt top! Yay! I'm in! I'd love to use ALL my stash, some of which goes back years, so I could start all over. I DO need to use up my stash. I always go in circles trying to decide if using the stash, using the scraps or finishing the UFOs is more important on my list. I've got some UFO plans working, so maybe this will be the stashbuster. I do have some scrapbusting going on to (but then those are turning into UFOs too). It is so great of you to share your lovely ideas with us. When I grow up, I wanna be just like you. Except I'm not moving to a colder climate. Stay warm, lady. Watch out for that blizzard headed your way! Yeah, I'm shrinking the stash, too, and I LOVE this pattern--perfect for straight line stitching. Thanks! I too am trying to use my stash and only buy plain fabric, if really necessary to complete a quilt. Great plan. GREAT quilt top! And "long division" is a super cool quilt name. Love the pattern! Thanks for sharing. I need to use up what I have as well-great inspiration! Good idea for using up your stash. I already decided not to buy fabric except for backing yardage until I make a sizeable dent in my stash. This quilt is a great way to do that. Thank you. What a great resolution/plan... looking forward to seeing what all you come up with... love your designs! so for the past couple of months I've been using my stash fabrics...and i have purchased some fabric, like solids to help put things together. With all that, I will be looking forward to see what you are creating from your stash! I'm trying to use up some stash too. I need it to all fit in the cabinet and right now it isn't (blues are particularly to blame). I am challenging myself in a different way. I am starting with backs. I have yardage of a few different prints that I bought thinking, "Oh that will be great for a quilt back." So I'm starting with some of that and making quilt tops to go with them. We'll see how that turns out. Thank you for showing your quilt and the directions. I love it and am going to make one, maybe more than one, who knows. Thanks for sharing! It's so fun to witness your intentions. I'd like to say I'll join in and I hope I can. This is my year to FINISH so I'm going to have to bookmark your ideas for when I find a lull in my work basket. Happy day, Amanda Jean. Thanks for sharing your talent. Great pattern, easy, and I may alternate colors.... like green & orange or something like that. I have way too much green and orange in my stash! What a pretty quilt. Thank you for giving the details so I can make one too. I am going to use up my stash before I buy more this year (luckily I don't have very much stash:D ). Isn't it amazing how you can make an entire quilt, (or two) from the stash and yet the stash looks EXACTLY the same as before you began? Can't wait to try this one, once I get another BIG project done first! Thanks for the pattern. Can you pdf it? Prints so much easier that way! That is the nicest way to bust your stash. The quilt is really beautiful and to do one a month is quite a challenge. I hope you can do it ( I know you will). GOOD IDEA. I like the simple but cute pattern as well. Your right it is a step in the right direction! I look forward to seeing what you have to share each month! I want to use my stash too. It's gotten a tad out of control. I also decided that I'll be working on quilts for others (as well as quilts for my house) - since I like to work on more than one project at a time anyway. That should help, right? I find myself looking down your stash box wanting a number of them for myself... How I wish I had a stash like that to get rid of. Then things would be easy peezy, lemon squeezy like my daughter often says nowadays. Great idea. Simplicity is my middle name. Kinda. Looking forward to the joy ride. Great idea! If you're looking for support stash-busting, come join us at StashPact11 on Flickr. There's about 100 of us, all supporting and encouraging each other to make and create from our stash! It's quite fun! Crazymom, you are my oldest and longest lasting blog crush - you're the best! That is an awesome idea! Cant wait to check back to see your progress! Can't wait to see what you come up with, I think this might look good in a single color with light/dark variations too. Love the idea of a scrap quilt every month! Nice work! I'm trying to make a Single Girl quilt from scraps and stash plus an Ikea sheet- I'm with you on using the stash! Very nice! I want to use more of my stash, too. I've whipped up some tote bags that use up a nice amount of fabric. 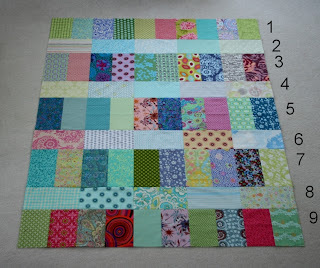 I would to do some scrappy quilts to use up smaller pieces. I can't wait to see all of the quilt tops you share here on your blog! Have you ever tried Quilt As You Go? I'm trying to break down some of my stash, too, and want to give QAYG a whirl; but I can't decide on an easy-peasy failsafe method to try. This is such a great idea and I can't wait to see what the next 11 months bring! Today I decided to bring out a quilt I started a year ago. It was originally for my daughter but then I did your quilt along ( almost done, ran out of binding fabric with only 45 inches left! !- i'll send you a picture when it is totally complete). So now I will have 2 quilts for her? Anyway, I am very proud of myself because I am DETERMINED to finish all the quilts that I have started over the past 5 years- talk about a daunting task!! However, I have a carrot- a very cute quilt that I really want to do- very motivational. I look forward to seeing all your great creations. Great (non-binding!) plan... and I'm still chuckling at your picture of your stash vs. your home colors. It happens around here, too! Looking forward to all these monthly posts! I truly love the simplicity of all your quilting!! What a cute and simple quilt! Thanks for sharing your directions. I am working on using up stash fabric and yarn this year. I can see myself making 2-3 of these! Yet another reason yours is one of my favorite blogs! We are always looking for easy stash-busting patterns for our quilt ministry - and this one just got added to the list! I'll be excited to see what you come up with next month! One a month? Wow. I could definitely get into that. I love this one you have started here. Simple is good. What a fantastic idea! I can't wait to see what you come up with each month. Thanks for a great tutorial too! What a creative idea to use up your stash! I love the simplicity of the pattern. Sometimes I look through my stash and wonder what I was thinking when I bought it. Other times there is just a little yardage left over from other projects. This concept would certainly help use up fabrics that do not play well together. I love your commitment to using your stash. I am on the same path. I have more stash than space. Quilts ideas/patterns like this inspire and motivate me. I know I won't be able to completely stop buying fabric, but I hope to cut way back until I have my stash winnowed. Thanks for your ideas!! as always, you make it look so beautiful!!! Fantastic idea, and I love this quilt design! Must try to sort through my stash with this design in mind... soon. You are my hero. Thank you for this inspiration. I will follow suit, and am honored to be in such company. My stash thanks you, too. Best. i just posted on my blog that i'm committing to buy NO NEW FABRIC in February - "No Fab Feb!" join the challenge if you'd like! you have inspired me so much! I made the coin quilt and started one yesterday with my "stash" of Denyse Schmidt's flea market fancy for a baby gift. Next I plan to make the long division quilt. I too am a working mom so simple, functional quilts is what I like the sew. Keep the ideas coming! Great idea and really nice quilt top! I'd really like to make a number of quilts to give to our local shelter. That's my intention for the year. We'll see how far I actually get. Super idea! Love your pattern! yay! this is super! I'm looking forward to all the fun stuff you'll come up with every month! i'm suspecting that this quilt actually gave you more scraps then? since you used so many different fabrics, but not really use them all up? or do i just have complete scrap busting on my mind?? How clever and generous of you! Fantastic idea to not only put a dent in your stash but to motivate and inspire the rest of us. You're a star! OK I've never left 2 comments in one entry before, however, I have a confession to make. I only needed half yard of Sandi Henderson's Meadowsweet 2 to finish the binding of your summers quilt along. It took me a while to find it on line. When I found it (if I had stopped at that it would have cost 4.50). Well who can order fabric without looking at everything they have to offer?!? Yep, you guessed it, 78 dollars later... What can a girl do? Good idea - this pattern would be really cute with batiks too, and I have a lot of them! I love this quilt AmandaJean! What a great way to use up some of your stash :) I have great plans this year to use up some of mine as well, so I might have to make a few of your stash quilts that you post about :) Thanks for the inspiration & tutorial! hmm....my goal is to build my stash. When I go to it, I'm always a little disappointed. Thanks! What a great idea and pattern :) Inspiring!! LOVE IT! I love love love that each fabric was only used once!!! So fantastic! I am definitely going to use this pattern! And I say every year as well that I'm going to use up my stash...Mine includes making costumes as well for theater. I always want to use my stash for shows, but find I end up buying something else. Aahh. Anyway, goodluck! I can't wait to see what you can do! Awesome! You've inspired me to use some of those miss-matchy pieces that I love. Can you explain how you made all those crazy patterns work simply by dividing them up by value? How did you place the value to look so great? That's something I need work on. Thanks for the encouragement and ideas! I like this "Long Division" pattern - very simple but very nice. Will maybe have to try it. (Looking through my stash, of course!) I like your idea of bigger pieces to show off the patterns of the fabric, instead of cutting them up for something smaller. I just want to instantly stash your project! It's very lovely! What a lovely idea. See if I follow, cannot promise this time. I've been trying to use more of my stash as well. I've been on a "fabric purchase diet" for several months. and when I do buy, I'm learning that it's ok to only get a fat quarter (most of the time). Love this quilt - just stumbled on it after being referred from another blog - this is a great idea. Thanks for giving all the details. happy stitching.. I will be a crazy mom follower from now on! Hi Amanda Jean, I made a quilt top from this tutorial. Thanks. You can see it here. I can't wait to start quilting it. Hi Amanda Jean. I made a quilt top from this tutorial too! I love it. You can see it here. I love this quilt. Thanks so much for doing the math and the tutorial. I KNOW I have the fabric to make it. I love quilts that showcase fabric. It is all so pretty! FYI I am linking this post to a Scrap Swap idea page at SewSara's blog http://sewsara.blogspot.com/2011/03/of-course-i-did-and-scrappy-ideas.html Thank you for sharing. I just printed this pattern off and will begin cutting the pieces I need. It will be a gift for a dear friend of mine. Thank you so much! :o) I am looking so forward to putting it all together. I am having a give a way if you are interested in dropping by. :o) I will be adding more scraps to the bag after I cut this quilt out. I made this quilt!!! I made it "LEGO" themed for my 5 yr old's birthday! I happened upon a bag of scraps at a consignment shop for $2! Inside the bag was over 300 2x4 inch fabric scraps. I was trying to figure out what to do with them and I think this quilt will be perfect for that.